"Lingua Musica tours are always a great experience ... a diversity of music festivals and performances in interesting venues, many featuring world-class artists. We have attended concerts in castles, chateaux, modern concert halls, baroque chapels and very old and ornate theatres. Accommodation is always excellent, travelling comfortable. We have free time at all destinations to "do our own thing". I would go on all the tours if I could!" Beverley Pether, Witchcliffe, WA, Australia. Your deposit is used to secure performance tickets. - In-depth lectures, plus a comprehensive Tour Handbook containing information on orchestras, soloists and conductors, and detailed programme notes for all major performances. International flights and airport transfers to and from your hotel at the commencement and conclusion of the Tour are NOT included in this tour. Please contact us if you would like assistance with your International Flights. Geneva is easily accessible by TGV from Paris. Your Tour Price includes transfer to Lucerne Rail Station plus a train ticket to ZURICH, from where there are many flights and trains to most major European cities. Join us on our journey which incorporates the most prestigeous Music Festivals of LUCERNE, GSTAAD, MONTREUX-VEVEY and SION, in the magic of Switzerland's mountainous terrain. 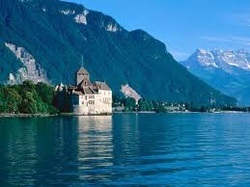 This tour commences in Geneva, where our stay in a luxurious hotel will delight. Our enthusiastic guide, who well loves her city, will introduce you to as much of Geneva as possible before we commence our journey of prestigious classical music festivals and spectacular mountain train journeys. 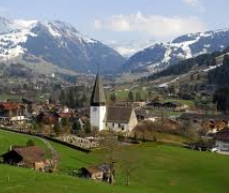 The first of our journeys brings us to picturesque GSTAAD in Saanenland, for part of the famous YEHUDI MENUHIN FESTIVAL, which the renowned maestro started and which has grown in prestige year by year, attracting the cream of the world's artists. The MONTREUX-VEVEY SEPTEMBRE MUSICALE also features world-renowned artists during its annual music weeks and you will enjoy greatly additional Swiss Riviera experiences here. 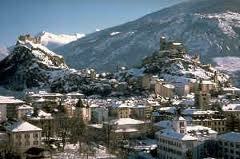 SION, the Capital of the Department of the Valais, spectacularly located below rugged peaks, is both a skiing and walking paradise. Its annual Classical Music Festival has become very popular within the music world. And of course, LUCERNE, that sophisticated small city on the Lake of the same name is, like France's Aix-en-Provence, the venue for another of Europe's most popular classical Music Festivals. Every year one is confident of encountering world-class distinguished orchestras, conductors and soloists. We will enjoy part of this Festival as well as Lucerne's other attractions. Itinerary follows but if you require any additional information please don't hesitate to telephone Roma Randles on 03 9589 0942 or 0407 942 296 OR Deborah Tresise on 02 9327 5733. Our tour commences in Geneva, where we will be staying in the HOTEL d' ANGLETERRE on the enchanting Geneva Harbour, with its famous dazzling white fountain, richly flowered parterres, aquatic fauna, swans, gulls, ducks, and myriad of colorful Regatta sails. This morning we commence our time in Geneva with a guided walking tour through the heart of Geneva's historic and picturesque Old Town, the Cathedral and City Hall, its secret alleyways and squares with flowers. We will visit some of the more important landmarks, including the Catherdral of Saint-Pierre with its austere Calvinist interior. Place Neuve, site of Geneva's Grand-Théâtre, the prestigious Conservatory of Music and the Rath Museum are also focal points of Geneva interest. We will also visit the the Place du Bourg-de-Four, around the beautiful eighteenth century flowered fountain. Here you will discover magnificent examples of sixteenth and eighteenth century architecture. Your afternoon is free for further leisurely exploration of this beautiful city. Program details to be provided. Transfer to Gare de Geneve for commencement of our spectacular train journey to the world-famous village of GSTAAD in the heart of the Swiss Alps. Gstaad boasts a wealth of very beautiful old houses in the chalet style typical of the region. Our Gstaad hotel is the alpine-styled HOTEL BERNERHOF, with its warm welcome and comfortable rooms. There will be time for you to explore the village during the afternoon. 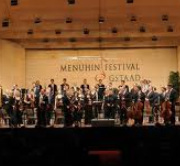 Our third Menuhin concert in its unique and impressive venue, is in fact the finale of the entire Menuhin Festival 2011. Today will be free for independent discovery. Perhaps you may be interested in joining a Mountain Excursion. The Bernerhof Hotel has a daily schedule and will be pleased to arrange for your inclusion. The evening is also free for you to sample the extensive village cuisine at your leisure. This morning we descend to Montreux, situated on the shores of Lake Geneva and surrounded by the majestic Swiss and French Aps. Here we stay at the superbly sited HOTEL EDEN PALACE, with its marvellous Belle Epoque reception areas overlooking the lake. The 15kms or more of the Montreux-Vevey lakeside, lined with vineyards, has come to be known as the Swiss Riviera. The beautiful and famous Quai des Fleurs is perfect for pleasant strolling whilst watching the swans drift by and the steamers criss-crossing the lake. 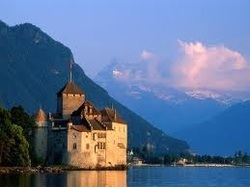 There are also many attractions in the town itself, including the nearby Chateau de Chillon, which owes its notoriety to Lord Byron's stirring poem about its fabled prisoner. We will attend two performances of this prestigious festival during our time in Montreux. Program details TBA. After a free morning, we meet in the early afternoon for another interesting train journey to SION, situated beneath towering mountain peaks, with glimses of Mediaeval castles. Here we stay in the rustique environment in the delightful Hotel des Vignes. Today will be a leisurely day exploring the environs. We will be collected by our driver for a pleasant journey by private coach through Swiss hills and farming vistas to our beautiful lake-side HOTEL HERMITAGE, where your rooms look out over sloping green lawns across the water to the spectacular peaks in the distance. This morning we will enjoy a guided walking tour focusing on the many sights of this delightful Swiss city. You will be introduced to tiny squares, wooden bridges over rushing water and fascinating glimpses of life as it was in a different era ... such a contrast to the glamour and bustle of this modern city. We will come to the very symbol of Lucerne ... Kapellbrucke, a covered wooden footbridge over the River Reuss, which was built in 1333. There are other lovely little squares featuring restored houses with painted facades, including "Panorama", one of the largest canvases in Europe, contained in an historic round building. The famous Lion Monument, carved deep into a sandstone cliff above the town is another great symbol of Lucerne. Our day will also include a visit to the lovely "Tribschen", home of Richard and Cossima Wagner for several years, now a museum. It is also where he worked on Die Meistersinger and Parzival. Beethoven, Liszt, Scriabin and Pintscher. Today is your own for independent exploration in Lucerne. There will be free morning before our lunchtime festival performance, in the glamorous Lucerne Casino. Our wonderful tour concludes after breakfast with your transfer to Lucerne Rail Station for the short journey to ZURICH. 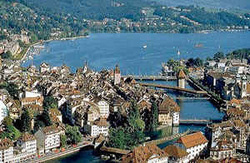 From Zurich there is the choice of many flights and trains to most major European cities.